What is unemployment? Unemployment, in a layman language, means that a person, who is willing to work, is not able to find it. The reasons for this could be many. For the condition meeting ‘employment,’ there should be a match between the requirements of the worker and the employer. A worker must possess the required skills, with ability and willingness to provide services. On the other hand, the employer must have the capacity to offer and honor the contract of work. He must have scope for equipping the employment. When even one of the conditions is missing, the result is unemployment. There are two broad categories of unemployment – voluntary and involuntary. So what causes unemployment? Let us first assume that there is a demand in the market and that the employer is willing and capable of offering employment. But the skills of the worker are not compatible or in line with the requirements. Skill shortage is one of the most critical, and acute factors that result in unemployment. i)In India, we have an extremely high number of youth, who are passing out of the colleges every year, ready to join the workforce. Unfortunately, the focus of Indian education is imparting degrees, and not necessarily readying its graduates for the relevant industry. Government and private companies add learning institutes in many numbers every year, but with little checks on the quality and capability of them to provide education. Take, for example, a study conducted that examined ‘English speaking skills’ which are often one of the ‘employable skills’ across 500 engineering colleges, covering almost 30,000 engineers. The findings of the report are disturbing – 3/4th of the total engineers that pass out annually from colleges are not employable. “Of the six hundred thousand engineers that graduate annually, only 2.9% candidates have spoken English skills”, find the study. ii) People involved in the seasonal occupation, often find themselves out of a job when the sowing period is over. Officials use Seasonal unemployment as the term for unemployment caused by changing seasons. According to a study, although the percentage of Indian workforce employed in agriculture has declined over the years, it still stands at 48.8% of the total. That means that almost half of Indian workforce is potentially seasonally employed. The reason why it is likely is that although traditionally agriculture has been viewed as seasonal, some farmers now practice alternate farming during the off-season. 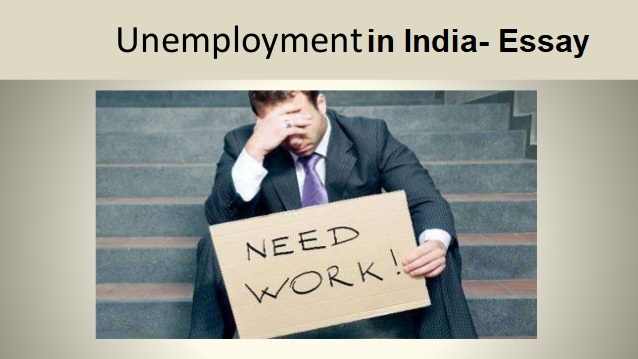 iii) Sometimes, unemployment can also be a result of geographical barriers. Most of the employment opportunities are available in urban areas. However, in India, almost 70 percent of the population still lives in rural areas. That means that out of a total workforce of 47.41 crores available, 33.69 crores were rural population. With rural areas offering insufficient employment opportunities, most of the workforce out of this 33.69 crore remains seasonally employed or employed in low-skilled jobs. Resulting is one of the reasons for migration of rural population to cities, although this leads to more and more pressure on the infrastructure of the cities, which, in turn, causes other problems. ii) Sometimes, there may be a decline in demand for jobs due to government policies, or other structural changes. For example, many global companies outsource their work to the Indian market, due to lower cost. However, if there is a change in their policies, like favouring their workforce, or discovering another cheaper demand market for such jobs, such jobs may dry up from the Indian market. This type of unemployment may be long lasting in nature. ii) Another kind of unemployment comes from business cycles. When the business is booming, the demand for workforce may increase. On the flip side, when the business slacks, it may force employers to cut down their force, and naturally, the demand for new workers will not arise until market recovers. This phenomenon may often be short-term. Additionally, there are factors which extend beyond the control of the individual or an individual employer. One of such elements is Indian population. Even if opportunities for employment increase, or new avenues are created for youth to be employed, these cannot keep up with the pace of population increase. With India poised to take over China as the most populous countries in the world, the pressure on the market is unimaginable. Another factor is Indian joint-family system. In India, many families jointly run their businesses, and often, without economic addition. This “disguised employment” is caused where one may ‘seem’ employed, but the value addition is negligible. A clear example would be a son ‘sitting’ with his father in his retail shop. Indian caste system curtails upward economic mobility. Some avenues are restricted to a ‘selected few’ because of their social standing.Therefore deserving candidates find it difficult to get jobs traditionally outside their purview. Lastly, we must account the role and implications of gender. In India, most of the female population gets educated to increase their marriage prospects and not necessarily, to better their job prospects. As per statistics released by the World Bank, India ranks third in the world regarding its female participation in labour – a shameful statistic. Women accounted for a mere 27 percent of the total workforce. What’s more shocking is that increase in educational qualifications is inversely related to participation in economic activity. Put just, even as more and more women are getting educated, fewer, and fewer are joining the workforce. i) First and foremost requirement is to upgrade our education system to better equip our youth with skills that make them employable. Update course syllabus to train our youth in skills that are relevant today. The focus should be to impart skills and not merely degrees, with graduates ready for industry. In addition to this, set up vocational training centres to give knowledge or skills – to better one’s chances of employability. ii) Undertake specific steps to decrease unemployment among women. Taking concrete measures aimed at removing the social barriers for their entry, as well as their prolonged participant in the job market. iii) Remove geographical obstacles, generate more and more employment opportunities in rural areas. It will serve a two-fold purpose. Employment opportunities will increase in rural areas. It will lower a tendency to migrates to urban areas.Which, in turn, eases the pressure that our bigger cities face. It might be a good idea for corporates to generate work opportunities as a part of their CSR exercises, in addition to the efforts of the respective state governments in this direction. iv) Increasing Investment in the agricultural sector. More investment to impart knowledge about the alternative sources of employment, as well as off-season cultivation options. Also, with an overall expansion of the job market, the workforce participation in agriculture should come down. v) With an aim to retain the workforce, Increase investment in traditionally labour-intensive sectors. It means all the handiworks, handicrafts, cottage industry, craft and other small-scale industries. Please like and share Unemployment essay post. Large shopping malls are replacing small shops.What’s your opinion? Good or bad?